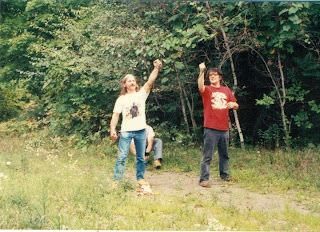 Plochmann Lane: Rick Danko, two buddies & a three-man slingshot @ Levon Helm's Woodstock, NY property. Rick Danko, two buddies & a three-man slingshot @ Levon Helm's Woodstock, NY property. Happy b'day to Bob Dylan! Happy b'day to Chris Bergson! Richard Manuel (center) @ Queen's College. Levon Helm & Ron Eoff @ NYC's Lone Star (1986). Rick Danko @ NYC's Lone Star.